Which is better for your home – central air or window air conditioning units? Is central air really better than window units? Generally, yes – central air conditioning systems are better (mechanically, functionally, and with respect to efficiency) than window units. However, it’s important to remember that “better” can be defined in many different ways. There are indeed some circumstances where a window unit might be the best option for your cooling needs. First and foremost, keep in mind that window units are intended primarily for cooling a single room (or area of a room). Window units are not intended to cool multiple rooms in the same building (or even an entire room if the room itself is large). If your goal is to cool a large area or multiple rooms, you should be considering your central air conditioning options, which may include ductless systems in addition to more traditional HVAC systems. Some people assume that today’s ductless systems really just represent an evolution of decades-old window units. Like window units, ductless systems are also intended to cool only a limited space (such as one room or one portion of a room). However, ductless systems are much more efficient than window units and can be installed as zoned systems with multiple indoor wall units. Ductless systems will also be much quieter to the indoor ear versus window units. Aesthetically speaking, window units carry the obvious baggage of having a large plastic-and-metal box jammed into your window frame – they block your view of the great outdoors, and they block sunlight coming into the room as well. Additionally, window units are louder to building occupants because their compressor is located within the unit itself (not outdoors or in a separate location). There are some limited situations in which a window unit might be the best fit for your cooling needs, including situations where you’re only concerned about cooling one room or where you’d like to supplement other cooling systems in hard-to-cool areas like a four-seasons room or a spare room over a garage. If you’re cooling multiple rooms and if the budget allows, central air conditioning is the more efficient, less costly-to-operate option to pursue. 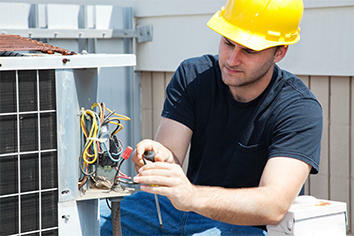 If you’re a typical homeowner, central air is the most cost-effective, energy-efficient way to go. Additionally, central air is the lease intrusive and most aesthetically-pleasing home cooling option.